We had company coming over for dinner and needed a tasty appetizers. Sliders are an obvious choice. However, why settle for one kind when it is just about as easy to make three different sliders with a bit of preparation. The bun is a critical part of a slider. I made Beginner Dinner Rolls from an earlier post. Instead of making 9 rolls, I made 12 so they would be smaller. You can use any small dinner roll you like. Then I prepared the tiger sauce by mixing the mayonnaise, horseradish, garlic and Sriracha sauce. I took out the other sauces (relish and sweet chili sauce). You can get sweet chili sauce in the Asian section of your grocery. I got out the toppings (bacon, jalapeno jack cheese, back (Canadian) bacon and slivered onions. I took the breakfast sausage out of their casings. I mixed 1/3 of the sausage with 1/3 of the ground beef. I made 3 patties each out of the remaining beef, remaining sausage and the beef sausage mixture for a total of 9 patties. I put the patties and bacons in a pan heated to medium high. While the meat was cooking, I put the tiger sauce on three buns, the sweet chili sauce on 3 buns and the relish (I used home made Zucchini Mustard Relish). Turn the patties and put the jalapeno jack cheese on the beef patties. Cut the back (Canadian) bacon into 3 pieces. Put the back (Canadian) bacon on the buns with the sweet chili sauce. Put the sausage patties on the bacon and put the top of the buns on. Put the mixed beef/sausage patties on the buns with the tiger sauce. Spread the slivered onions on top and put the top of the buns on. Put the beef patty on the buns with the relish and put the 1/3 slice of bacon on each patty. Put the top of the buns on. Serve and act modest when everyone tells you these are the best appetizers ever. These vanished. They were gone in minutes. Everyone loved them and thought I had done a ton of work because there were three different types when it really didn’t take a lot more than making one type. Make these. People will think you are a genius. Make a tiger sauce by mixing the mayonnaise, horseradish, garlic and Sriracha. Mix 1/3 of the sausage meat with 1/3 of the beef meat. Make 3 patties each of the remaining ground beef, the remaining sausage and the sausage/beef mixture. Put the patties, the bacon and the back (Canadian) bacon in a medium hot fry pan. While the first side is browning, spread the tiger sauce on 3 of the buns, the relish on 3 of the buns and the sweet chili sauce on the remaining 3 buns. Turn the meat and put 2 squares of jalapeno jack cheese on the beef patties. When all the meat is cooked, cut the back (Canadian) bacon into 3 pieces and put it on the buns with the sweet chili sauce. Put the sausage patties on the back (Canadian) bacon and put the bun tops on. Put the beef patties on the buns with relish. Put one of the pieces of sliced bacon on the beef and put the bun top on. Put the sausage/beef patties on the buns with the tiger sauce. Sprinkle the onion slivers on the top and put the bun tops on. Serve and blush when everyone tells you how great they are. I gotta tell you my friend, as much work as you do on that back porch and the quality of your foods, you should charge for small intiment dinner parties. I mean others besides SWMBO’d…. Nice job there on the sliders. Wine or a good larger with those? So good to hear from you, Foamheart. I am paid for my cooking, I have good friends. As for beer or lager, I am a Canadian so I hate conflict and serve both! 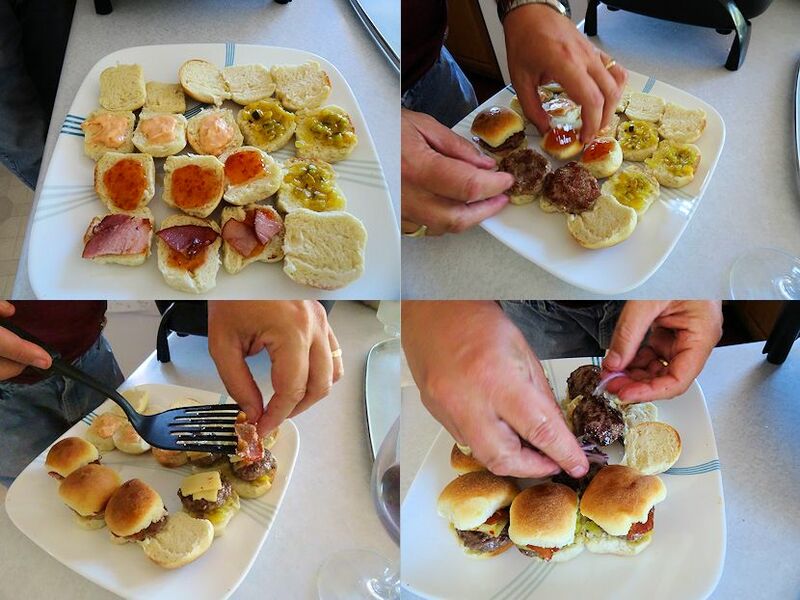 I love serving sliders in my BBQ parties. These all look great!! Thanks so much! 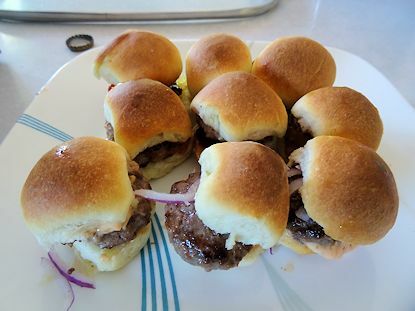 Sliders are definitely a nice appetizer. These were so good, and it was difficult to decide which one was tastiest. These look very tasty. Nice job on those dinner rolls too!